Welcome back to a world of sub-$40 oil. Crude crumbled below $40 a barrel on Friday for the first time since March 2009. It's a watershed moment for the meltdown in energy prices that began last fall. Keep in mind as recently as June 2014 crude was hovering north of $100 a barrel. The latest crash in oil prices is another sign that the world still has more oil than it knows what to do with at a time when uncertainty on global growth reigns supreme. Oil is staring at a massive supply glut that's been led by the surge in production from American shale oil producers. To the surprise of some, U.S. oil companies have kept pumping rapidly this year despite depressed prices. That's in part because newer technologies and cheaper expenses have made it profitable to produce even at lower prices. Normally, when prices fall, OPEC steps in and cuts production. But not this time. The cartel, led by Saudi Arabia, has refused to dial back and continues to pump out a record amount of oil. Some see that as part of a strategy to pressure American shale oil producers and drive them out of business. It is also a way to flex its muscle at a time when its grip on the global oil market has faded. OPEC used to make up about 60% of the global oil market. Today that number has shrunk to 40%, largely because of surging U.S. production. Geopolitics may also be playing a role. Iran's nuclear deal with the West sets the stage for that country to flood the market with more oil and worsen the supply glut. Some analysts believe Saudi Arabia, a longtime rival of Iran, may keep pumping oil just to turn the screws on Iran. The Saudis also have the cash flexibility to weather the storm for a bit -- something Iran lacks. Not only is there too much supply, but demand has been sluggish. Developed economies in Europe and Asia are barely growing and emerging markets in Latin America are stumbling. That's especially true in China, which has slowed dramatically recently. No matter the cause, the crash in oil prices has been great news for American consumers. It's almost certainly leading to "sub-$2 a gallon" prices at the pump, according to Tom Kloza, chief oil analyst for the Oil Price Information Service, which tracks retail prices for AAA. 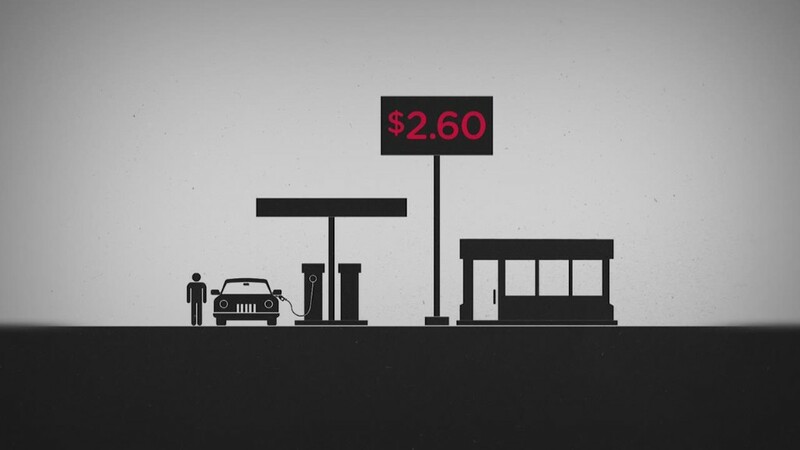 A gallon of regular gasoline now fetches $2.65 on average in the U.S., according to AAA. That's down from $3.44 a year ago. At the same time, cheap oil is weighing previously-booming oil states like North Dakota and Texas. The oil slide is also weighing heavily on pockets of the stock market. The energy sector of the S&P 500 has lost nearly one-third of its value over the past year alone. Individual companies like Chesapeake Energy (CHK), Transocean (RIG) and Marathon Oi (MRO)l are down more than 50% a piece in the last 12 months. The oil plunge has spooked some investors who fear it's a warning sign about the global economy. They argue if all was well in the world oil would be rising, not falling. If oil settles below $40 a barrel it could be looked at as another bearish signal by energy analysts. That's something that hasn't happened since February 2009.